Oregon is filled with well located towns that serve as hubs for outdoor enthusiasts drawn to a particular landscape, climate, or sport. Port Orford, Ashland, Joseph, and Hood River are just a few of Oregon's towns on the smaller end of the spectrum that feature passionate communities and incredible access to the outdoors. If you're searching for the outdoor capital of Oregon, however, look no further than Bend. A thriving climbing, hiking, and mountain biking mecca in the summer and fall, Bend also shines in the winter, when some of the same fantastic summer trails and backcountry routes are transformed into magnificent winter playgrounds. If you've enjoyed Bend at all, you know there are endless choices for winter terrain and entertainment. Once you solve the issue of winter access, your imagination is the limit. Taking a break at the old Swampy Lakes Shelter. This structure was dismantled, and a new shelter now stands. Photo by Tyson Gillard. Versatle, reliable, and intuitive, snowshoes can be just the key to open up a winter gateway. The right set of snowshoes will get you enjoying the popular summer routes in a less crowded season. Or, if you can incorporate some backcountry training and preparation, there is an ocean of gorgeous snowshoe terrain to explore just outside of Bend. Whatever your time and circumstances, keep in mind that finding the right snowshoe for your body, your load, and the terrain is a key consideration. Selecting a light-duty snowshoe for a backcountry trip will mean tons of extra effort, slow progress, and possibly some dangerous exposure; grabbing a set of backcountry snowshoes for a simple walk on an easy trail will mean extra weight that can also wear you down unnecessarily. We've assembled a short list to get you started in the Featured Adventures seciton below, and we've tried to represent a spectrum of adventures. The short, family friendly snowshoe spots have a little more infrastructure such as warming huts, trailhead toilets, and easy winter road access. Longer snowshoe routes may require some ingenuity in terms of access in addition to a basic level of fitness and winter skills, but you'll also enjoy some of the Northwest's most spectacular winter landscapes. Have a look at these incredible spots, but you should also get creative finding your own adventures. 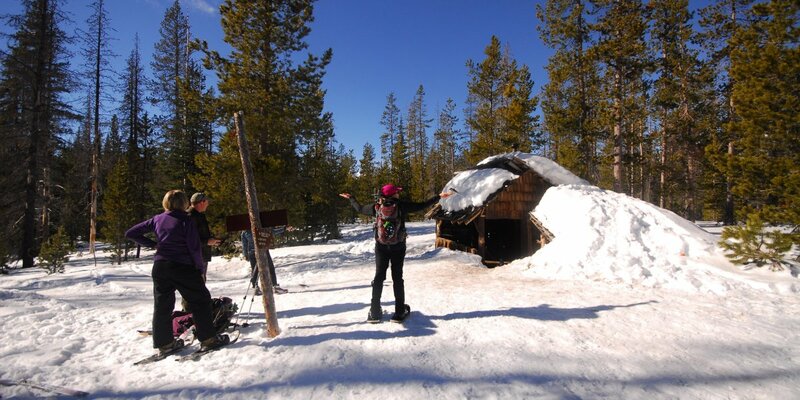 How many of your favorite hikes near Bend are waiting to become your new favorite snowshoe routes? 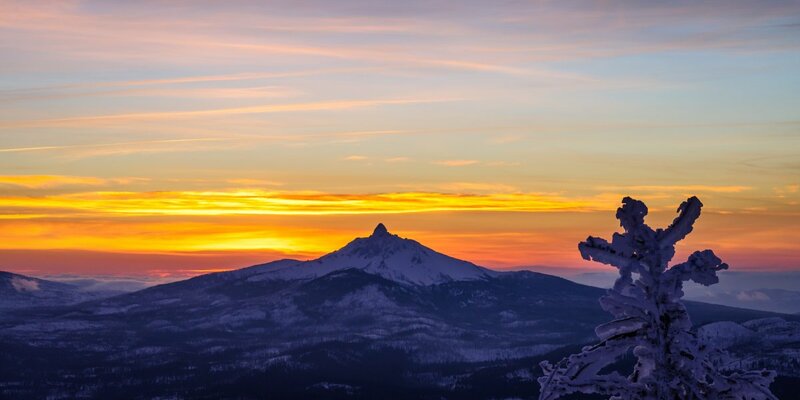 A sunset view of Mount Washington from Black Butte. Photo by Mark Lehrbass. Swampy shelter has been dismantled and a new shelter has been built nearby on new trail.